Jonny Blonde takes his inspiration from the beautiful ingredients he uses, the farmers and artisans he works with and his fans - the people who love his food and support his business. His commitment to local starts in the kitchen with the high quality local ingredients he works with. He sources hormone-free meats and fresh seasonal ingredients and makes everything from scratch – from butchering his meat, to homemade breads, salads and delicious sauces. Outside of the kitchen, Jonny and Layal are committed members of their community where they support numerous charities, area farmers and businesses. 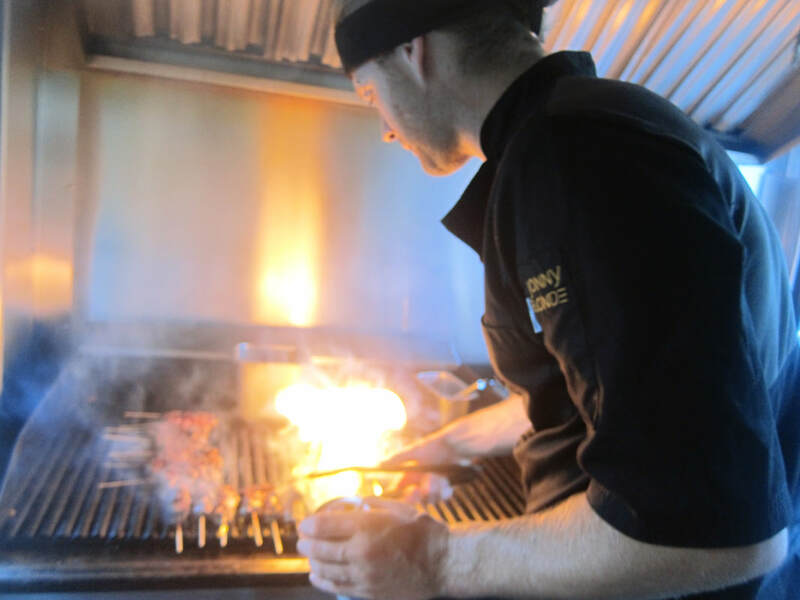 Jonny Blonde has been cooking professionally for over fifteen years. Born in Spain and raised in Hamilton, Jonny dropped out of high school and got his first job in a kitchen at a chicken wing joint. He went on to make a name for himself at two of Burlington/Oakville’s finest Italian restaurants (La Costa and Amici-Impazza Ristorante) and soon after was designing tapas menus at popular Burlington Lakeside cafe, Fava in the Middle. When opportunity knocked, he moved to Toronto to work for Cumbrae’s high end butcher shops selling prepared gourmet foods and naturally-raised meats. At Cumbrae's, Jonny was introduced to artesanal food and it’s ties to health, the environment, local farmers and sustainability, which had a major influence on his cooking. Soon he was head chef Cumbrae’s newest kitchen in Dundas, where he began participating in cooking competitions and regularly appearing on local television to cook and talk about food. Although Jonny had found his passion in cooking, he decided to go back to school, completing his GED and attending McMaster part-time towards a degree in Economics. The degree now hangs on his wall - a reminder that he can do anything and that cooking is his #1 choice, not his only option. Operating out of Hamilton, Jonny feels blessed to be able to do what he loves in the city he calls home. Layal- aka. the Gypsy is Jonny's parter in life and business. Six months after meeting Jon in 2012, Layal made a radical shift, quitting her job in Toronto and moving to the Hamilton area to open their food truck in July 2013. Layal handles everything outside of the kitchen - from coordinating and booking events, to staffing and managing the business. Layal has a Bachelor of Journalism and a Masters in Documentary Media from Ryerson University. She spent ten years living in Toronto and working in television current affairs, documentary and media relations, while bartending and serving part-time - all of which has provided invaluable experience in her current role as an entrepreneur in the food industry. Follow her on Instagram @gypsylulublonde and on her blog at JonnyandtheGypsy.com.